(1) Register by supplying information about yourself as a player. (2) Pay for annual Premium Membership, which costs $7.00. This panel covers the first step, information about you. Much of this information is mandatory, such as name and date of birth. CXR will check your name against other names in the database, since it is possible that your name may already be registered with CXR. 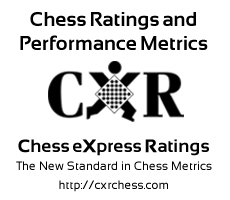 Rating: Provide the following only if you already have an official chess rating. Otherwise, just click Submit. System Player ID no. : For example USCF player ID no. By clicking the "Submit" button, you agree to the standard CXR Player Service Agreement. To see this agreement, click here.